Ask John to sell you a bottle opener. Devoted to the art of soda pop and supporting the small businesses behind each bubbly drink, Galco’s Soda Pop Stop features more than 500 flavors of soda at its Los Angeles storefront and nationwide through its website. Beginning in 1897 as an Italian grocery store, Galco’s changed “flavors” when son John F. Nese took helm of his father’s store in 1995 and lined the shelves with classic, small-batch, exotic and hard-to-find sodas. With a mission to support small soda makers, Galco’s motto is “Freedom of Choice” which mirrors Nese’s determination that customers have the right to choose from more than just a handful of mass-produced, big-business selections. When you are inside Galco's you often see people with shopping carts full of exotic and small batch runs of soda pop. When I went there on vacation with my family we bought so many different kinds of soda pop that we barely had time to drink them all before we had to get back on the plane. In addition to his large selection of pop he also sells handmade sandwiches and old time candy. The kind of candy your dad ate when he was a kid. One of my favorite things about the store is the "make your own soda pop" station at the back of the store. There you can take a bottle fill it with carbonated water, mix and match from about 80 different flavored syrups, and then cap the bottle. This is a place you must see. If you can't get there they will ship their product anywhere to you in the country. 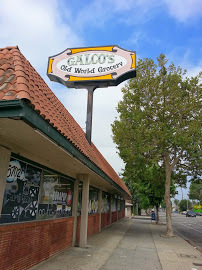 Galco's store helps keep a lot of small American and European bottlers in business. “We’re a little business helping other little businesses,” says Nese.